Unity IAP provides quick and easy tools to create and export Product Catalogs. Use the Unity Editor’s IAP Catalog window to populate Product metadata, then export the catalog to the Developer Dashboard to configure each Product’s creative assets. Note that you must use the IAP Catalog function to export Products to the dashboard. Note: A Product Catalog must have at least one Product configured to export. For a complete walkthrough on setting up Products, see documentation on Codeless IAP. Copy-paste your Products into the IAP Catalog GUI. Remove or comment out existing builder.AddProduct() code from your purchasing script. 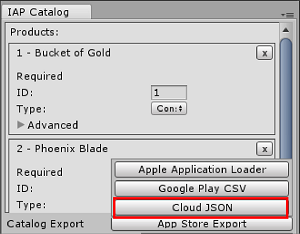 In the IAP Catalog window, select App Store Export > Cloud JSON to export a local copy of the Product Catalog. Manage your Product Catalog on the Operate page of the Developer Dashboard. Your active Project appears in the top-left corner. 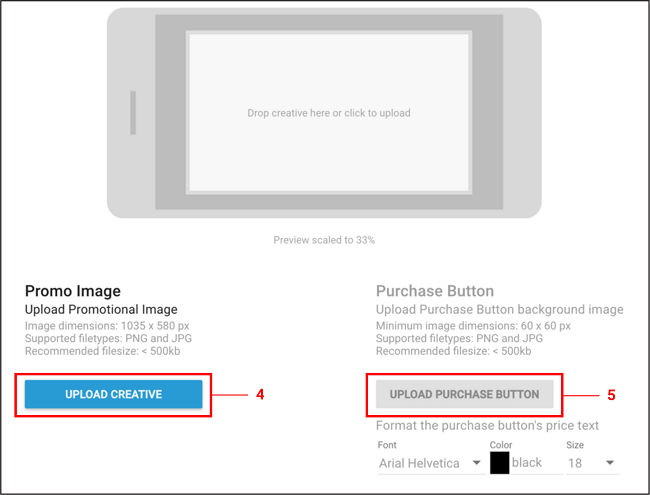 To manage Products, select Monetization > Define In-App Purchases from the left navigation bar. You can populate your Products manually, or bulk-populate them by importing a JSON file. Click the SAVE button to store the Product in your catalog. Select the JSON file you exported from the Unity Editor. A diff log then prompts you to approve changes. Check the contents of the file, then select APPROVE CHANGES. The imported Products appear in the Product Catalog list. However, in order to be eligible for Promotions, each Product must have an associated creative asset (otherwise there is nothing for the Placement to display). Select a Product from the Product Catalog list, then scroll down to the Creative Uploads section. Note: While each Product’s Product ID, Name, Price, and Type appear in the dashboard, you can only edit these attributes from the Editor’s IAP Catalog window. 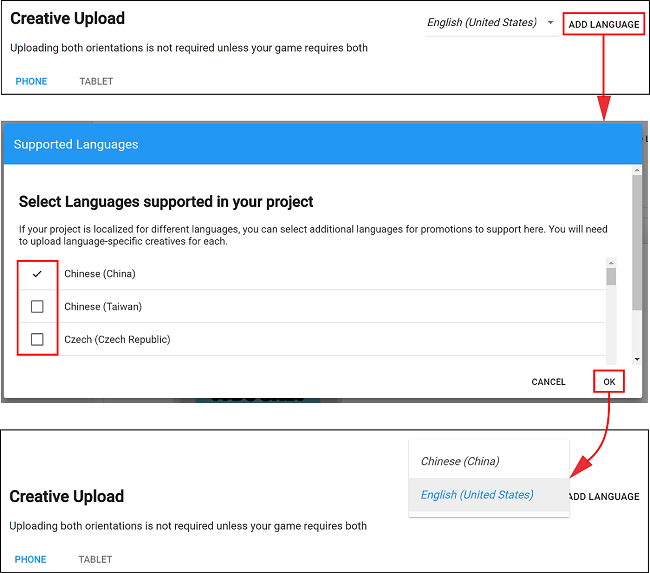 To specify unique creative assets for different regions, select ADD LANGUAGE, then check the languages to include. Note: The drop-down indicates the current language you are editing. If an included language has no creative assets, it defaults to using its English (United States) creative assets. PNG or JPG file format. Each Product requires a creative asset for at least one configuration to be eligible for Promotions. For a better consumer experience, provide optimized creative assets for each device and orientation. Phone creative asset dimensions are 580 x 1035 pixels for portrait orientation, and 1035 x 580 pixels for landscape orientation. Tablet creative asset dimensions are 900 x 1200 pixels for portrait orientation, and 1200 x 900 pixels for landscape orientation. Select UPLOAD CREATIVE to upload a creative asset. A preview appears on the left. You must upload a purchase button to proceed. Minimum file size for the button asset is 60 x 60 pixels. You can click and drag the purchase button on the preview window to place it. You can format the font, color, and size of the button text. Select SAVE to proceed. Upon returning to the Product Catalog page, your Product is now Promotion Eligible. Note: You must export and submit your Product Catalog to the appropriate Google Play or iTunes store for the purchase flow to work. Please see the Export section in the documentation on Codeless IAP.